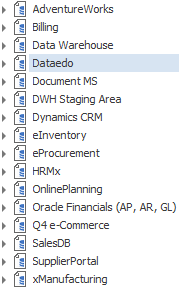 Dataedo repository is where you store your database schemas and documentations. Repository is organized into documentations and each represents a database schema. This is a server based repository that supports concurrent work and requires an instance of SQL Server. This is actually a regular SQL Server database (no other software is installed) with a predefined schema to keep all Dataedo data. This is a .dataedo file that stored on any disk. This is actually a SQL Server Compact database that is stored as a file on your disk. This database has the same schema as server based. It is advised to limit the number of repositories. However, you can have as many repositories as you like. Create one repository for each group of users - this could be a team, department, project or product. If you are software development or consulting company you may choose to have a separate repository for each customer. Those repositories can be located physically at your customers' premises.